Dating older men has become the cool thing among many young career women and college girls. Two of them shared their experience with the Star newspaper. 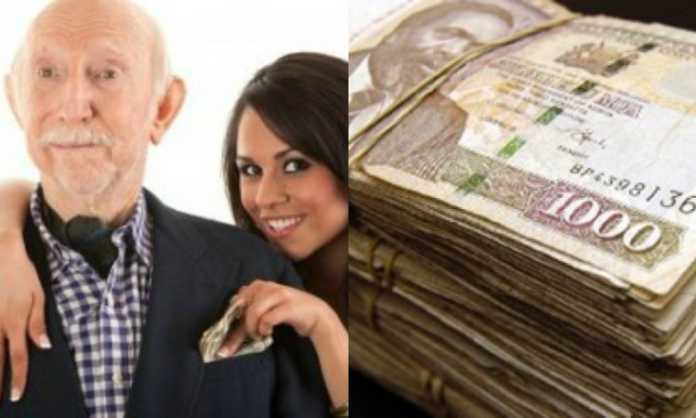 The phenomenon itself has long existed before this generation, but the term ‘sponsor’ was introduced recently to refer to older men who date young women and give them money. One does not necessarily have to have an intimate relationship with a girl for him to be considered a sponsor, but one automatically becomes a sponsor once he gives money to a girl for whatever reason, be it for rent, upkeep, hair, nails, rent, tuition or even partying. In most cases, a sponsor is often someone’s husband, who is bound to leave the beneficiary for his family when all is said and done. Those who have embraced the habit of having a sponsor get money and in return his dry bones get to creak under her caressing care, and he gets rejuvenated by her youthful warmth. He can pay her rent in a decent apartment, buy her jewelry, take her places she only reads about in magazines or use his position to get her a job. Fauzia, 23, and Wambui, 24, have openly decided to share their life in the city of Nairobi, which is well taken care of by having sponsors in their lives. How did it all begin for Fauzia? “My parents died and I had two siblings who were still in school, whom I had to take care of as well as educate them as the big sister,” she said. “I am a Muslim and because of my religion, I was forced into marriage before even completing my school. The marriage was not successful because we did not know each other and we were just brought together by our parents. The guy became abusive and I decided to leave his place together with my children. Remember I also had my siblings and my aunts don’t even recognize us. “The only option I had due to the challenges I was facing then was to look for a man in a dating site. That was my first sponsor I would say in my life. Wambui, on the other hand, said she has come from far. “I came from a very humble background, and I was raised by a single mother,” she said. “Unlike long ago, when sponsors were said to be above 50 years, I have two sponsors; one who pays rent, and the other one pays school fees for my kid. One is 32 years and the other one 38 years. “I have a deadbeat baby daddy who does not even know where his child lives or what he feeds on. The reason I can’t date young men is because he (baby daddy) was a young man and ran away after three months; he abandoned us. The 26-year-old university student was killed on September 3 in Homa Bay county. Migori Governor Okoth Obado has been charged with her murder. He denies the charges. She had attended a party at Wasini Luxury Homes on Church Road, Westlands, about 100m from where her body was found. A former governor has denied involvement in the case.